Today, Saturday, 7 October 2017, is the World Day for Decent Work (WDDW). 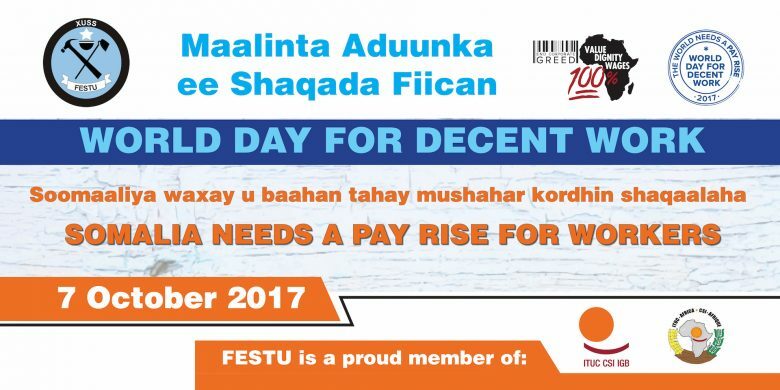 The Federation of Somali Trade Unions (FESTU) is joining this global commemoration led by the International Trade Unions Confederation (ITUC) in calling for social justice, decent jobs for all and end of corporate greed. 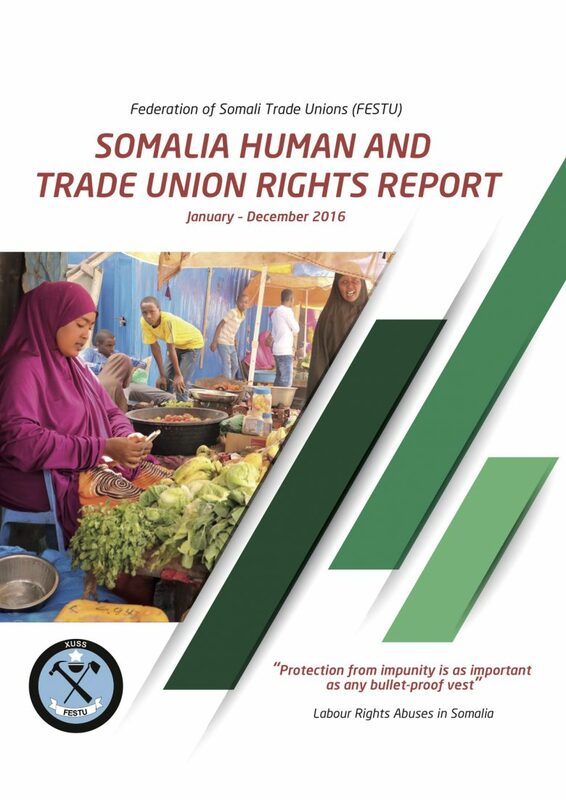 Countrywide, unbelievable numbers of Somali workers endure precarious, uncertain and unpalatable working condition. Millions of Somalis have lost hope in securing any form of employment, while those who are lucky find themselves in the informal economy. Unemployment figures alone are a cause for concern, but even these figures fail to capture the larger majority of people who do not have a decent job, with a decent wage, social protection and access to rights. The social economic crisis facing Somalis require an urgent and rapid economic transformation, which means putting the workers first. FESTU laments the persistent existence of non-conducive working environment at work places and non-payment of salaries to workers, who have worked for months without any payment. We say no to poor pay, salary arrears, unemployment and bleak national future. We want progress, living wage, conductive working environment, decent attitude in our regions and in our country. FESTU is pushing that decent work should be at the heart of our federal and regional strategies for economic and social progress. The current prevalent precarious working conditions can only be combated through a wide-ranging policy response that includes economic, fiscal, and social policies geared towards full employment and income equality, a regulatory framework to reduce and ultimately eradicate precarious work, and greater efforts to empower workers by ensuring that all Somali workers can exercise their right to associate, and to bargain collectively, freely, and without fear. FESTU welcomes the initiative of the Federal Government in developing a public-sector pension policy and efforts to secure a decent retirement benefits for civil servants. We urge the government to craft worker-friendly policies. When the President of the Republic and the Prime Minister are continuously promising creation of jobs, it’s very deplorable that the government is still lacking to sit down with labour movement and employers to reach agreement on the validation and implementation of ILO-led Decent Work Country Programme (DWCP). Words must match actions. We will be holding the national leaders to their words on job creation. Copyright © 2019 FESTU. All Rights Reserved.